Jazzy’s Quest: Adopted and Amazing is the first in a planned series of books about fourth-grader Jasmine, her transracially-adopted family, and the birthfamily with whom she maintains an open relationship. In this first story, Jasmine feels alone. Her adoptive family is musically talented and intends to enter a community talent show, but Jasmine is not gifted musically. She talks to friends, her adoptive family, and her birth family in an attempt to discover what her talents might be before learning that her talents are already within herself, and just need some creative channeling. 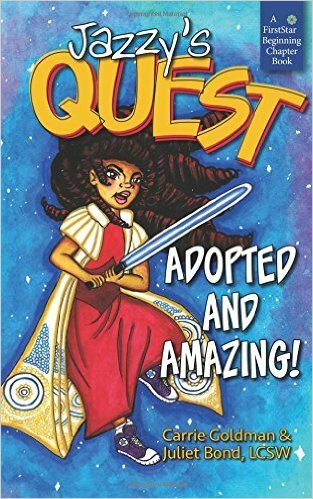 Jazzy’s Quest benefits from a wonderfully engaging writing style, and lets kids know that it’s OK to be themselves. It’s particularly helpful to have a story that features – and explains! – open adoption. The story does not shy away from acknowledging Jasmine’s feelings of being “different from everyone inside our family,” but responds to those fears in a caring, helpful and healthy way. Jazzy’s Quest connects with real feelings, and is not overblown or overly dramatic. The story has a ring of truth about it, which likely comes from the author’s consultations with her daughter, who is also adopted. This books seems likely to become a favorite for many adoptive families with young kids. My 9yo daughter, who was adopted, loves this book! I even caught my 7 yo son listening to her read it and I could tell he enjoyed it too! Best book for adopted young elementary age kids ever! I'm so glad they liked it!